Robinson was born on 19 November 1823 at Tetney, Lincolnshire. He was converted at the age of 12 as a Sunday School scholar. Robinson became a local preacher at the age of 14. Two years later he was a hired local preacher and entered the ministry at the age of 18. Robinson was Secretary of Conference in 1875. In 1879 he became Secretary of the General Committee, a post that he had to resign from due to ill health in 1883. His contribution in that role was duly recognised in an appreciative minute in the 1883 conference proceedings. Robinson married Harriett Hudson (1827-1867) in 1850 at Hull. Census returns identify eight children. James Alfred (1859-1928) – a PM Minister until 1907 when he became a Roman Catholic. Robinson married Mary Thompson (1819-1897) in 1868 at York. Robinson died on 17 November 1888 at Scarborough, Yorkshire. 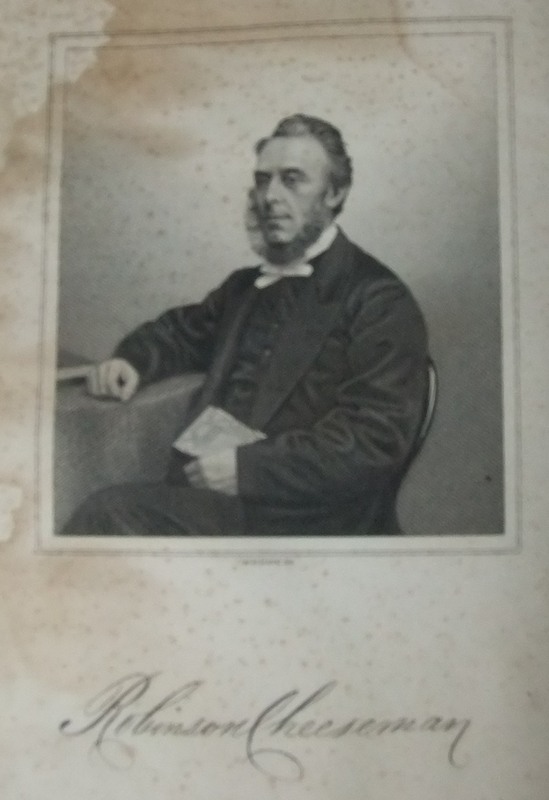 Robinson’s brother Thomas Cheeseman was also a Primitive Methodist minister. Robinson Cheeseman was my great great grandfather via his daughter Mary Ellen. My grandfather used to speak about his own grandfather and a number of uncles who were preachers. Your website has given me names and dates which have enabled me to “flesh out” this branch of my family tree.